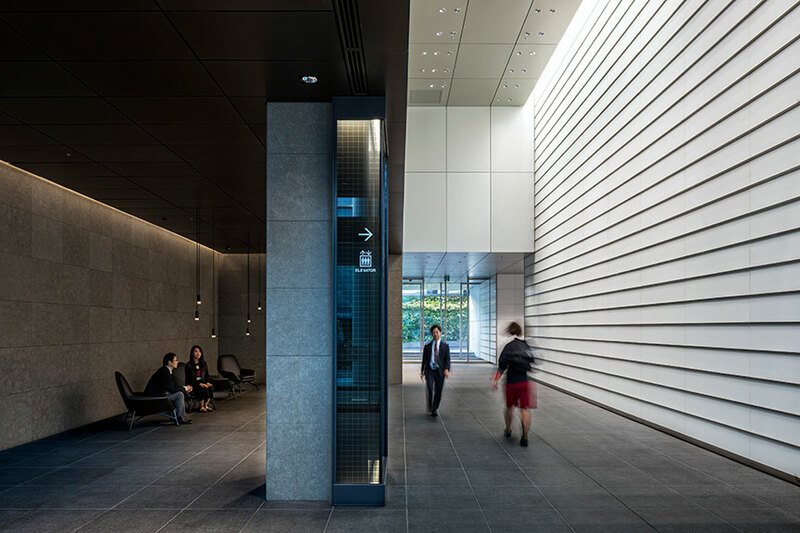 Jingumae Tower Building – Jun Mitsui & Associates Inc. Architects｜Pelli Clarke Pelli Architects Japan, Inc. 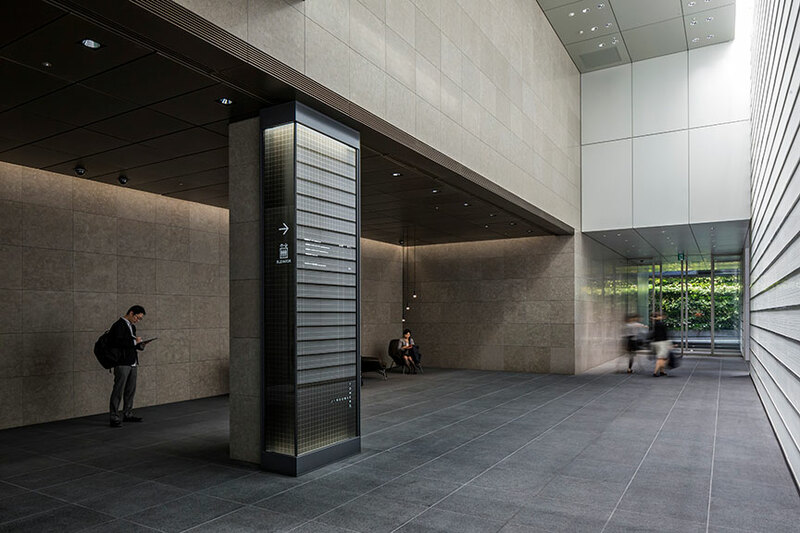 Located on the corner of Takeshita Street and Meiji Street in Harajuku, the Jingumae Tower Building is an office/commercial complex with 23 floors above ground. 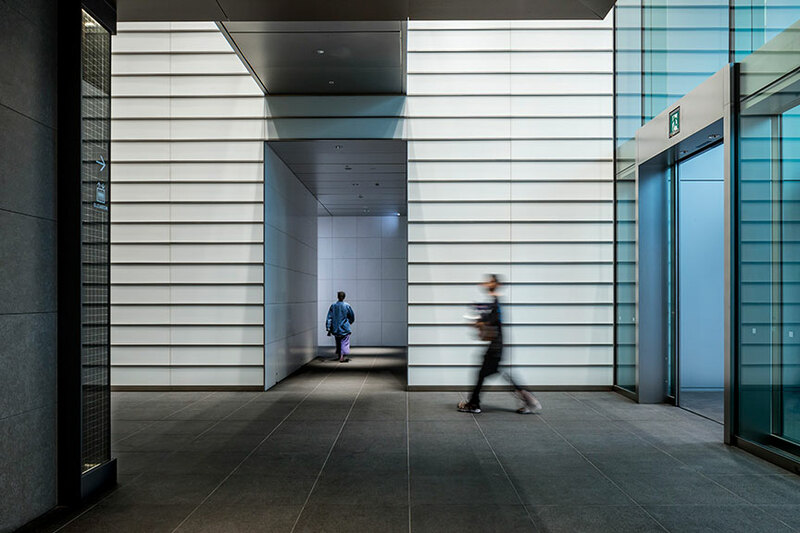 The lower part of the building is for commercial facilities while the upper levels are for office tenants, mainly businesses in the IT and apparel industries. 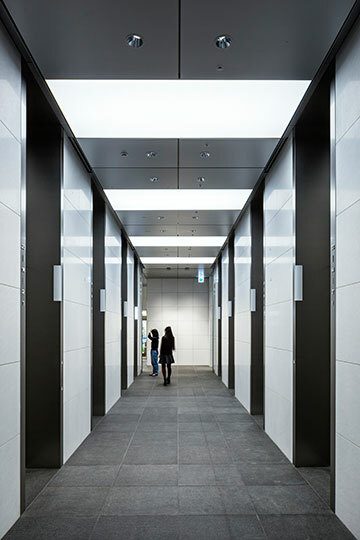 We were tasked with the interior design of the office entrance hall and the wall greening at the carriage entrance. 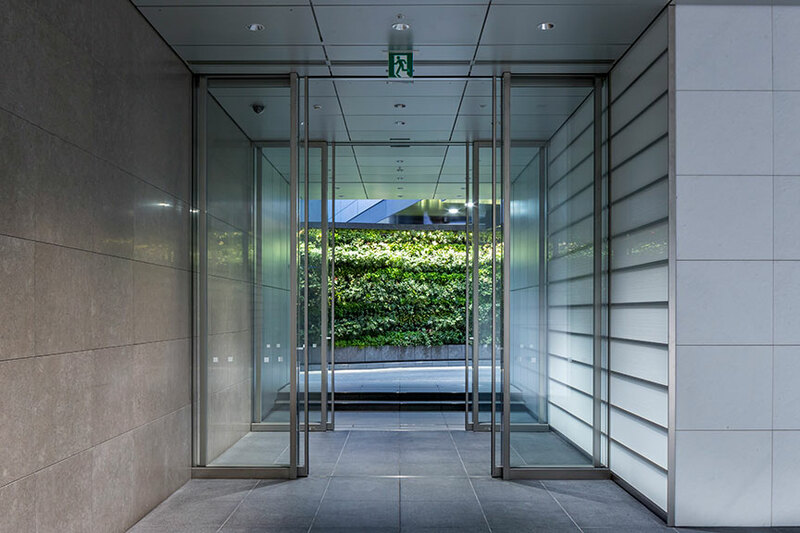 For the entrance hall, we sought to inject into the building elements of the leafy green environment of the adjacent Togo Shrine and Meiji Jingu Garden. 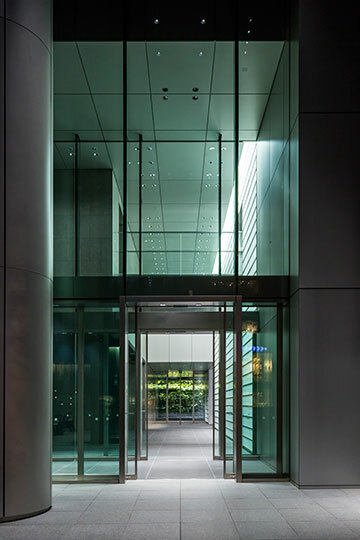 In addition, in recognition of both the cutting-edge, trend-setting vibe of the neighborhood and its lush natural surroundings, we designed the entrance hall to create an atmosphere of greenery, dappled sunshine filtering through trees, and sparkling light. 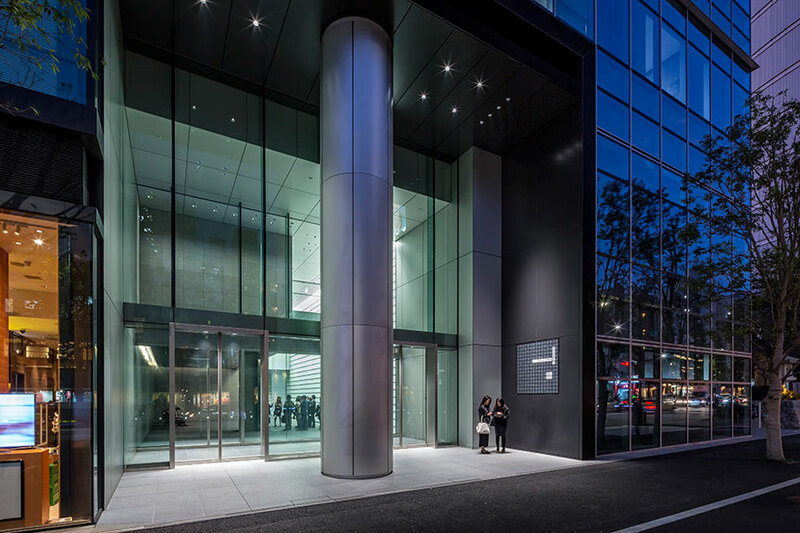 While ensuring the sense of leafiness from the wall greening outside extends into the building beyond the sub-entrance, we created a feeling of luxury and prestige for the office area by adopting simple yet high-quality materials such as stone, glass and various metals. 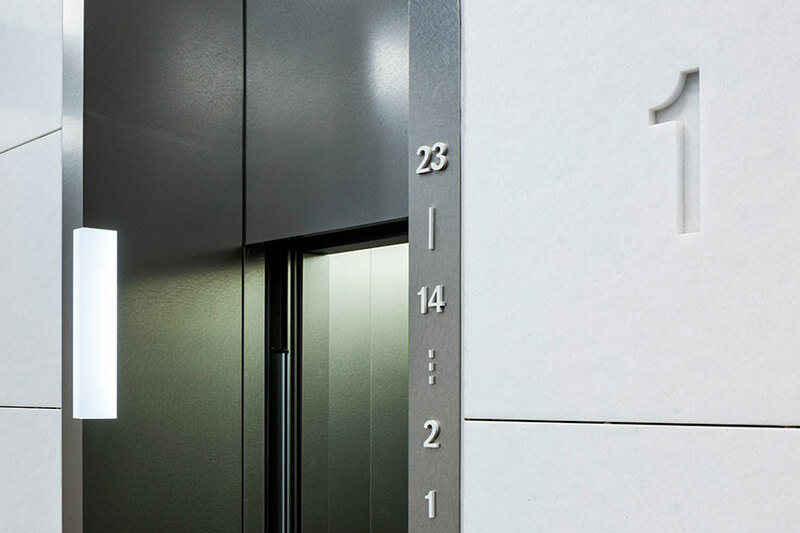 For example, designer glass is installed on a stairwell wall with a ceiling height of eight meters above floor level. We also took extra care with the lighting plan, creating a gradient from top to bottom and using a coved ceiling and downlights to give visitors the impression of light filtering through trees. 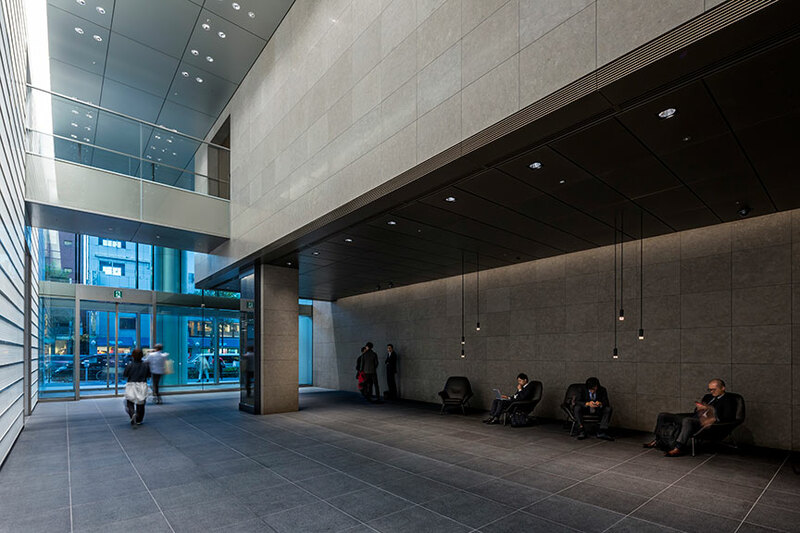 In addition, for the granite wall that makes a pair with the designer glass, we adopted high chroma stone to prevent the offices from looking cold and create a warm atmosphere when combined with the wall greening seen in the back. A ceiling that is lower than that of the main traffic line, the spacious lounge sofas, and the hanging pendant lights bring added warmth. 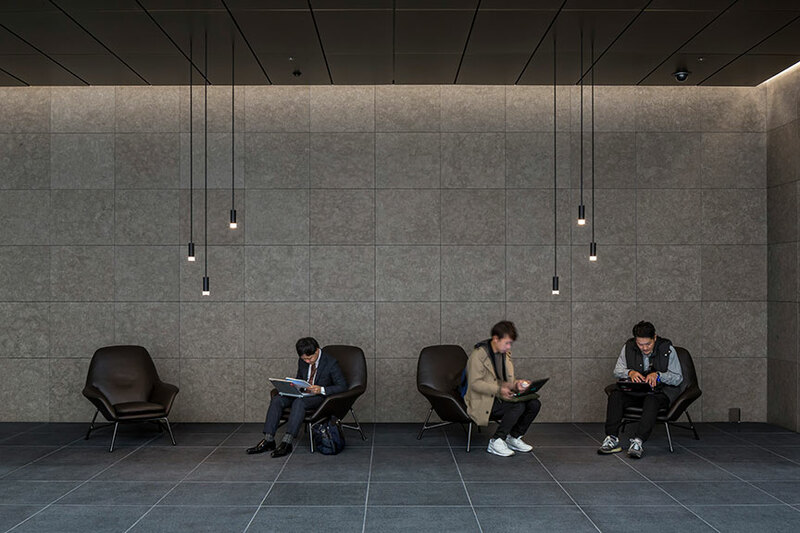 In short, the lounge was designed to be a meeting place where visitors can enjoy a short break.